The Green Corridor of Cali, Colombia aims to redevelop an old unused railroad into a sustainable mobility corridor. The project is one of the shining examples of integrated transport shared with us by Dario Hidalgo. Image courtesy of Juan Yunda. On October 7 – two weeks ago today – TheCityFix reported on UN World Habitat Day and the release of the 2013 Global Report on Human Settlements. Now that the report has been out for a while, we’re following up with Dario Hidalgo (DH) and Robin King (RK), two EMBARQ experts who were contributing authors for this year’s UN-HABITAT report. Marking the vital importance of efficient, integrated transport systems in cities worldwide, the theme of the report was planning and design for sustainable urban mobility. In order to find out how much progress we’ve actually made in implementing sustainable transport systems around the globe, we asked Dario and Robin to enlighten us. What did we find out? There are lots of encouraging examples of sustainable mobility systems worldwide, but there’s always more work to be done. What are some good examples of physical integration of transport and land use? DH: A few great examples of cities that have excelled at this kind of integration are Hong Kong, Singapore, Copenhagen, Denmark, and Curitiba, Brazil. 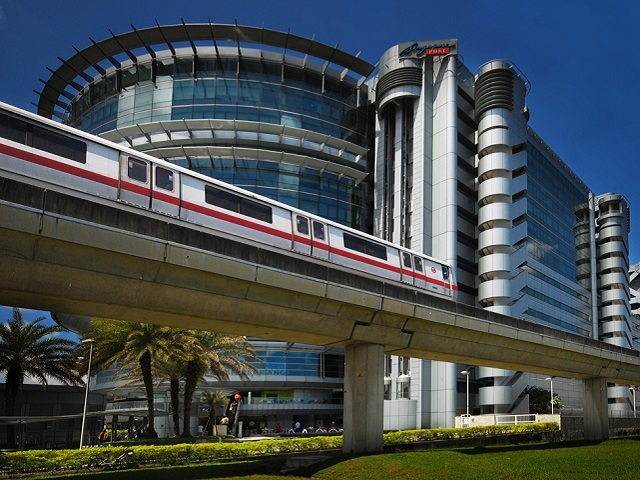 MTR Corp, the subway operator in Hong Kong, reported about HK $4 billion (US $506 million) in sales revenue from properties located above their stations in 2010 alone, which accounted for 32% of the their income that year. 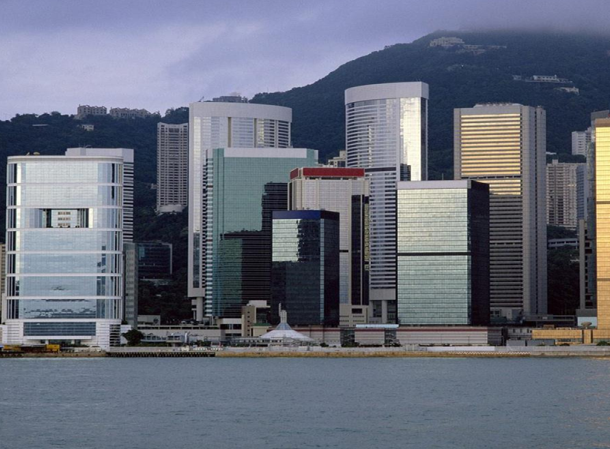 Hong Kong is one of two Special Administrative Regions of China. 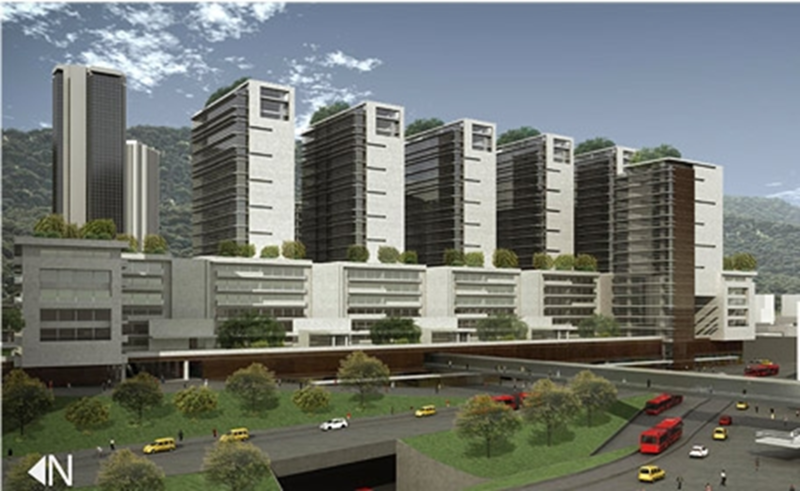 It has long been heralded for its successful mixed-use development projects, like the MTR Corp scheme to build and sell apartments located above their stations. Photo courtesy of Oren Tatcher. Singapore, a sovereign city-state located at the southern end of the Malay Peninsula, is also often celebrated for its compact, mixed-use urban development. Photo by William Cho. Business Center Winghouse, designed by Henning Larsen Architects, is a ubiquitous symbol of Copenhagen’s innovative urban design. Photo courtesy of Henning Larson Architects. 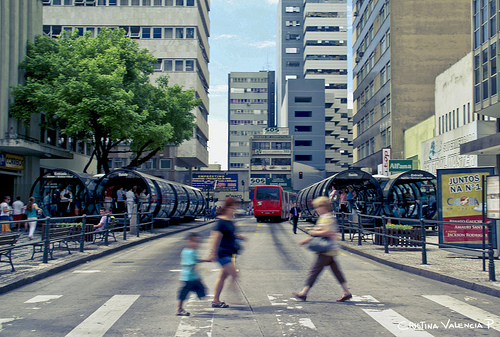 Curitiba, Brazil has been a beacon in sustainable urban mobility ever since one of the first BRT systems was implemented there in the 1970s. Photo by EMBARQ. DH: Some examples of good upcoming projects in integration include the Bogota Central Station Redevelopment Project and the Green Corridor of Cali project. The Bogotá Central Station Redevelopment Project will update the city’s transportation infrastructure at strategic points. The new and improved central station will connect to major access routes in the city, and at least one multi-use real estate project. Image by Empresa de Desarrullo Urbano, Bogotá. 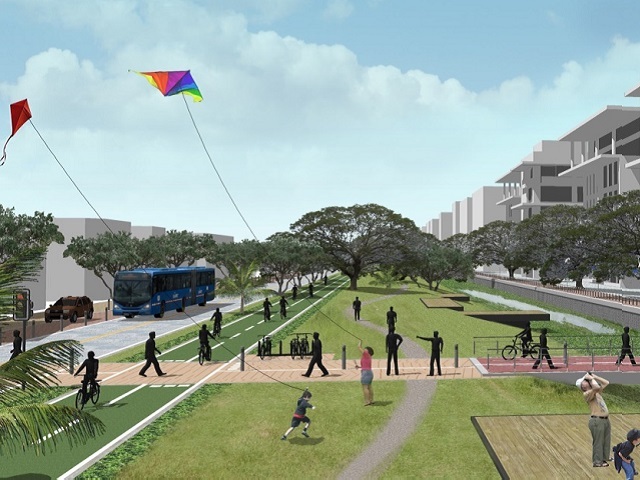 The Green Corridor of Cali, Colombia aims to redevelop an old unused railroad into a sustainable mobility corridor. The proposal includes a hybrid-electric BRT system, pedestrian walkways, and a high traffic bikeway. Image courtesy of Juan Yunda. How about examples of good integration between multiple transport systems, located in fast growing cities in the developing world? DH: Despite a rough start, Santiago de Chile now has a fairly good quality, integrated and multimodal transport system. São Paulo has also advanced significantly in the last decade with the Bilhete Único which can be used in buses and metro. Mexico also recently introduced a single card for Metro and Metrobus, and announced an eventual citywide integration across the Metro, Light Rail, BRT, Regional Rail, and regular bus networks. Do people really want to bike or walk in countries with emerging economies, or do they prefer to buy a car as soon as they can afford it? DH: The general trend in developing countries has been a decline in walking, biking, and public transport in favor of motorcycles and cars. But, there are some outliers to this broad trend. Bogotá, for example, has been able to stabilize the share of riders on public transport, slightly increase the rates of walking and biking, and slightly reduce the amount of trips made by cars. In rapidly expanding cities, these slight changes in mobility trends can add up over time. RK: People want to be able to move around conveniently, reliably, safely, and affordably. Where alternatives exist that fulfill these requirements, they get used by all kinds of people. This requires not just systems that work – be they public transport or bike sharing – but also attention to sufficient, accurate, and timely information as well as complementary infrastructure such as parking for bikes, and sidewalks/footpaths that are connected and safe. The important thing is to build these into cities as they are being built to create lifestyles around these possibilities – a long term structural challenge, but one that has been successful in cities like New York, Tokyo, Amsterdam, Copenhagen, and Hong Kong. Over time we would expect to see Mexico City, Bogotá, and others added to that list. Throughout the late 1990s and first decade of the 2000s, Bogotá experienced a stabilization in public transport ridership, slight increases in walking and biking, and a slight decrease in the amount of trips made by cars. Graph by Bogotá Como Vamos 2012. 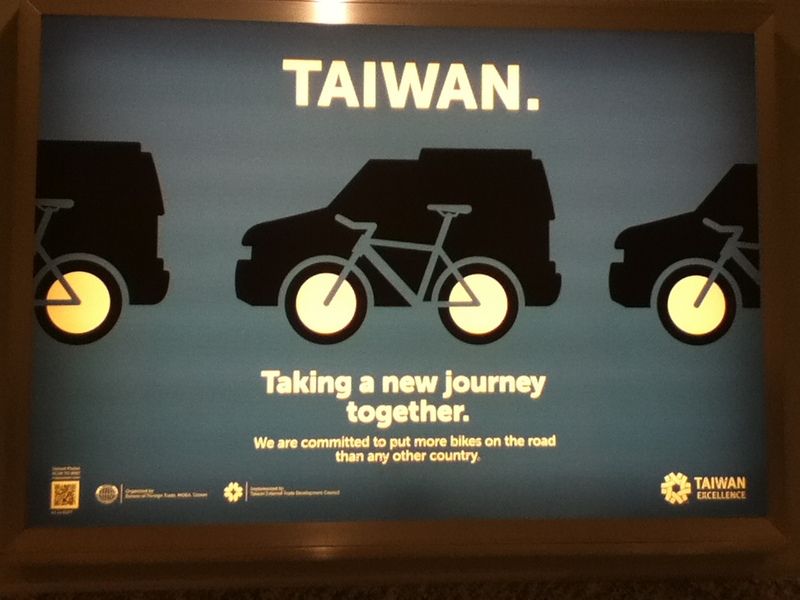 Taiwan advertises its commitment to putting more bikes on the road than any other country at Newark Airport in Newark, New Jersey, U.S. Photo by Dario Hidalgo. What would you tell to someone who has the choice between taking the BRT – overcrowded and a bit slower – or riding at 3 on a motorcycle? DH: There’s little anyone can say to an individual user facing this choice. I would actually work with authorities to try and improve the quality of public transport by increasing capacity, to make journeys less crowded for passengers, and by improving reliability through better control. These improvements are absolutely possible for any BRT system – all that’s necessary is some initial investment and eventual operational subsidies. At the same time, you have to try to make motorcycles less convenient. Higher compulsory insurance rates according to their share in traffic incidents, injuries and deaths, higher requirements for motorcycle users to provide licenses, better control of parking – like no free parking in public spaces – and even “congestion charges” could make motorcycles a less attractive choice, and rationalize its uncontrolled growth. RK: As Dario says, changing the “convenience” factor is key. So is making riding public transit higher status and “cool”, not the choice of last resort. Why is EMBARQ working with UN-HABITAT? How has this partnership changed things on the ground? DH: UN-HABITAT is the leading organization of the United Nations (UN) system working with cities. They have a strong and reputable voice in the international dialogue on human settlements. The current head of UN-HABITAT, Joan Clos, is a very highly regarded ex-mayor of Barcelona and has great influence with UN members. Teaming up with UN-HABITAT helps EMBARQ get the sustainable transport message heard by many national and local leaders. It’s truly amazing that in the preparation for the release of the UN Sustainable Development Goals (which will replace the Millennium Development Goals in 2015) UN-HABITAT chose the theme of sustainable urban mobility for the annual Global Report on Human Settlements. We were very happy to contribute to the report with updated information on the status and opportunities for mass transit, which is such a critical topic in rapidly evolving cities. Although we haven’t recorded any direct influence of this work yet, we know it will be used as an authoritative reference by decision makers worldwide. Whether or not we will help the decision process is uncertain, but spreading the message is crucial to gradually changing the global urban mobility paradigm from moving cars to moving people. This shift is already being reflected in several national programs – see India, Brazil, México, Colombia, and China – but more needs to happen! RK: What excites me about our collaboration with UN-HABITAT is that it is a chance to cross-pollinate ideas from sectors that don’t always talk sufficiently to each other – in the case, transport and accessibility with those more focused on housing and other basic urban services. Close collaboration between these sectors, and the people working in them, is critical to creating sustainability mobility options that work and help create opportunities to connect people with opportunities to create more livable, thriving cities.